So annoying. I get sent a review copy of a work of fiction. I warn them that I probably won’t have time to read it properly, but promise to do my best to have a quick flick through it and to write a polite notice for the website to note that the book has been published. And then I get captivated by the very first page, and have to read the whole darn book right through to the end. And now I’m even further behind on my other reviews and write-ups that have been piling up for so long. Many visitors to this site will have come across the author, Mark James Russell, whose Pop Goes Korea we warmly recommended. It’s a long way from journalism and coverage of the pop culture industry to writing a full-length piece of fiction, but Russell has successfully made that leap. Young-hee is a Korean girl who has a grey existence in a boring apartment complex in Seoul. Somehow she manages to find her way into a Narnia-like world; but instead of the heavy Christian symbolism of CS Lewis’s fantasy, the strange world in which Young-hee finds herself is full of all the characters from Korean myth and folk tales: living totem poles, tricksy dokkaebis, hungry ghosts, a sinister fox-woman, a talking tiger and more… she has to negotiate all these in a quest to find a mythical plant which will enable her to buy back her annoying little brother from the dokkaebi in the goblin market who has kidnapped him. Who might be the target audience? Russell says he thought he was writing a fairy tale for adults. But the cover artwork is aimed at a younger audience. 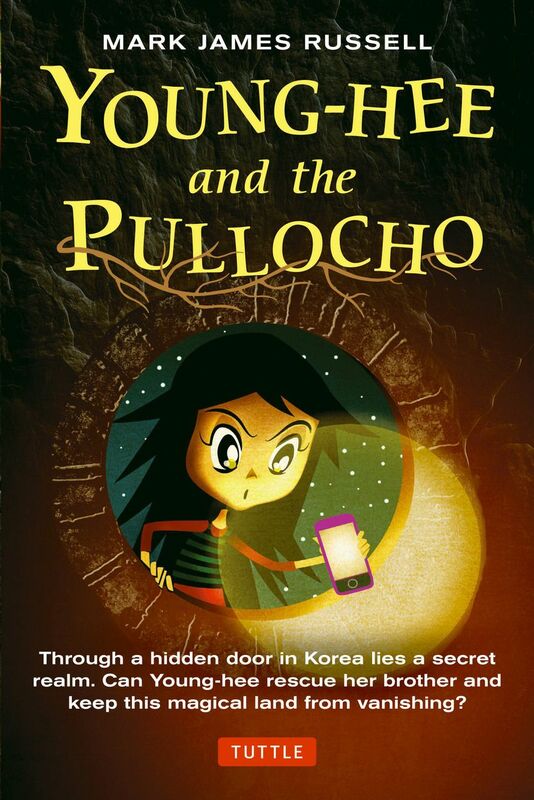 And it would be absolutely perfect for a young Korean who has grown up in New Malden or somewhere in America – this is a great way to get re-introduced to some folklore. But Young-hee‘s audience deserves to be much wider. It’s a riot of a book which certainly appealed to this particular child, and represented a very pleasant diversion from my self-imposed obligation to write up certain Korean events which now may never get reported. We all need to escape from our grey existence every now and then, and this book is a very enjoyable way of doing it.